You've just brought out your string trimmer after a long winter's nap. It starts up without a problem, and at first glance, the string looks fine. Then, just as you begin trimming, you start to notice small pieces of the line breaking off. As you continue to trim, you see your line getting shorter. String trimmer line gets quite brittle with age, and that causes it to break off in small pieces as you use it. 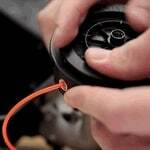 Replacing your string will correct this problem and make your trimmer more efficient. Select your line based on what your trimmer's user manual suggests. You don't want to overload your trimmer with a line that's too thick or it'll bog down the motor. 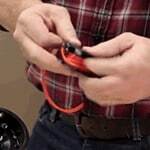 Take apart the trimmer head by unscrewing the bump knob and removing the inner reel and spring from inside. Pull out the old line and throw it away. Clean out any debris that's collected inside the trimmer head. If the trimmer head's assembly screw is loose, set it aside where you won't lose it until the time comes to reassemble it. Cut two 10" pieces of line and double them together. 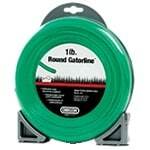 Insert the lines into one of the holes in the reel and pull it in toward the spool until only a couple inches remain. Take hold of the remaining line, insert it into the other hole, and then pull the line tight to close the loop. This will hold the line in place so it doesn't spin loosely inside the head. Wrap the line on in the direction of the arrow on the reel. You'll see a small arrow embossed or embedded on the trimmer head. The location of the arrow differs on each trimmer head but should be somewhere near the outside edge of the reel. Be sure you add enough pressure to keep it evenly wrapped. You want to make sure you don't leave too much slack, or it'll feed poorly when you try to bump more line out. Once you've got about six inches left unwrapped, push the strings into the holding slots to keep them in place until the next step. Reinsert the spring onto the shaft the same way it was before you removed it. Make sure to hold it down to prevent it from falling out. Locate the eyelets on the spring head. While keeping the spring in place with one hand, use the other hand to push the strings through the eyelets. Pull them firmly into place, and continue holding the spring as you move onto the next step. Return the reel back to its original position on the shaft and line up the holding slots found on the reel with the eyelets found on the head. Hold the reel down, compressing the spring, and place the bump knob back onto the top of the trimmer head. Screw the bump knob back onto the trimmer head. Don't pull too hard, just easily pull the lines and ensure they've released from the holding slots. Once the line is in its proper place, you're all set. Start it up and give it a few spins to make sure it's set in place well, then go trim some pesky weeds. Bumping Fresh Line - Find out How to Change Line on a Bump Feed String Trimmer. Our string trimmer how-to library can help you pick the perfect electric string trimmer, gas string trimmer, walk behind string trimmer or brush cutter.